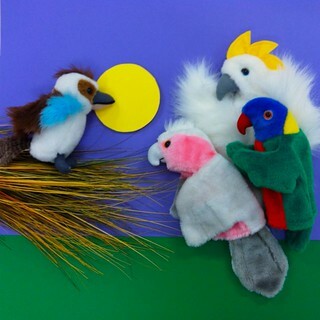 Students in Early Stage 1 and Stage 1 have been studying the Aboriginal Dreaming Story of “How the birds got their colours”. This week, they are investigating birds. Our playground is currently well-populated with large crows (or ravens?) and the students have been enjoying (or being blamed for) their hilarious antics: tossing scraps out of the bins, stealing shiny rocks from a memorial garden, and frog-marching pigeons out of the playground. I found some fascinating Youtube videos that demonstrate the intelligence of crows, as they complete an exercise involving a three-step plan, and then an eight-step plan. Remember Aesop’s fable of “The crow and the pitcher”? Early Stage 1 and Stage 1 students are learning about Aboriginal Dreaming stories. Additional audiovisual resources on whales, starfish and barnacles, used in previous years of the cycle, are HERE. This week, students in Stage 1 and Early Stage 1 are learning about a local Gundungurra Aboriginal Dreaming story of Mirragan and Guranggatch, which tells of the creation of the Nepean River, Blue Mountains and Jenolan Caves. It was first recorded Europeans in the early 1900s by RH Matthews. We are watching this Photo Peach slideshow, which uses the art from a school-created “big book” from 1995. The beautiful artwork is by Mrs Bagnell, with one mural panel by a former Penrith PS teacher, Mrs Martin. In 2013, a Stage 1 class retold the Aboriginal Dreaming story of The first sunrise as a digital story on Photo Peach, using art from a school-created “big book” made by Mrs Bagnell, way back in 1994. This week, Class KB retold the Aboriginal Dreaming story of Mirragan and Guranggatch to create a new Photo Peach slideshow using the art from a school-created “big book” from 1995. The beautiful artwork is by Mrs Bagnell, with one mural panel by Mrs Martin. Then Class 1/2St retold the Aboriginal Dreaming story of The first sunrise, with art from another school-created “big book” made by Mrs Bagnell, this time from 1994. This presentation to the teacher-librarians of Granville District, followed by a practical workshop, looks at how teacher-librarians can work with students to create book trailers to enrich learning, maximising the engagement of students in literacy activities. Applications used to make trailers will be looked at and discussed, also how they can be used as a resource in a school library and in classrooms, and how they can help promote reading. * UPLOADING – to Photo Peach or other Web 2.0 facility – Flickr slideshow, PowerPoint/Keynote, podcast/Youtube, IWB Notebook software? * SHARING with the wider community – monitor incoming public comments regularly, or close them off. * This year’s CBCA Book Week theme was: “Read across the universe”. A starting point? * The kookaburra who stole the moon on FLICKR, and also on PHOTO PEACH. Stage 1 students narrate how they inquire, learn, create and share with ICT and Web 2.0 to produce online Photo Peach slideshows at Penrith Public School. View the article online HERE. The Photo Peach slideshow featured in this article is recently restored, and now located at photopeach.com/album/18cw2b6.